You can never have too much of a good thing. 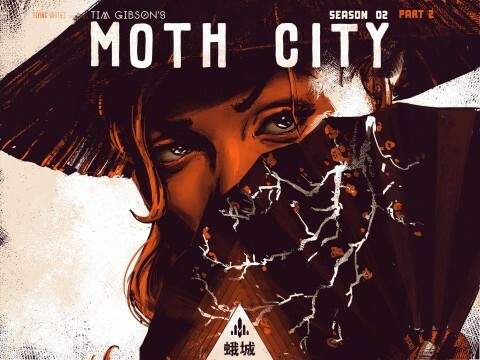 That’s why this week, for Webcomic Wednesday, I return through the digital space to look at Tim Gibson’s Moth City, as it releases the second half of season two on Comixology. And like an old friend, it feels good. Moth City is still great. A unique mix of zombie horror, period drama, and film noir, it continues to impress on a level that rises above most webcomic fare. In fact I am glad that this series has found its way onto Comixology because it deserves to be up there with some of the bigger digital efforts. Coming from its fourth issue (or its second half of season two) on the market place, while finding itself on its third season on its own site, it still maintains its quality while bringing in something new. This something new is really just a confirmation of the genre ties – the film-noir elements come to a head as character motivations become less and less clear, and the story takes a decidedly more zombie approach, with a fairly impressively drawn and animated scene involving a man with half his face off. Coupled with a cliffhanger I honestly wasn’t expecting, this series is good stuff. If you want a great mish-mash of genre and a strong case for the digital comic, check it out here. Or pick it up on Comixology on the cheap (it looks really nice on the iPad).